"May all the holes in your path hold large hairy spiders." 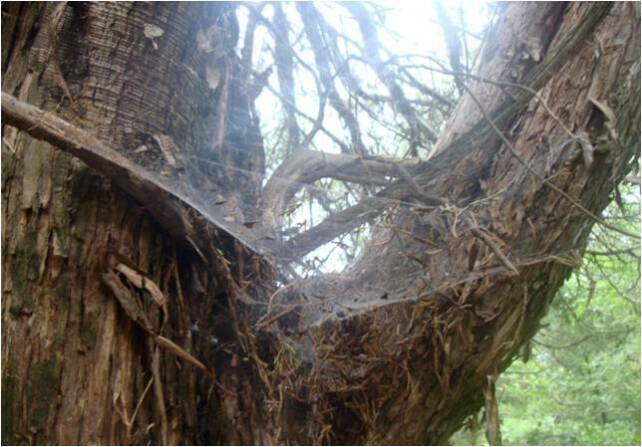 Spiders use silk to make homes. 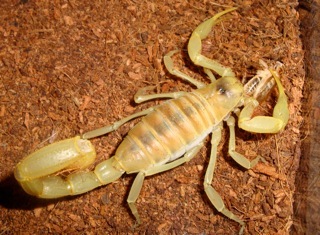 Striped bark scorpions mate for life. They live under rocks and in wood piles. They have a painful sting, but it's not dangerous to humans. Erik and I had a Goliath Bird Eater who went through a bad molt. Her fangs didn't molt all the way, leaving her unable to eat. 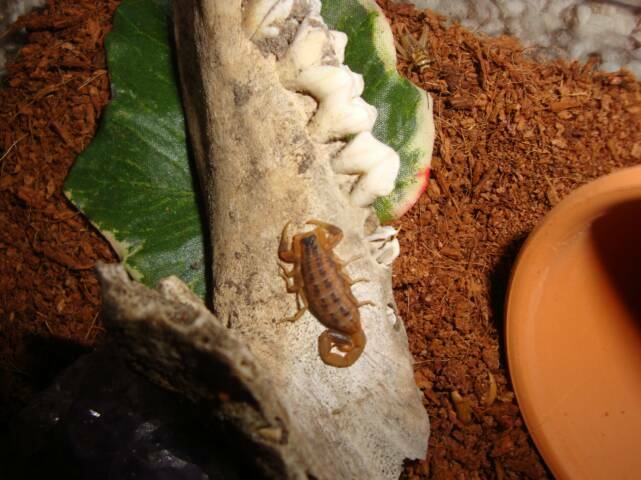 I made cricket soup 3 times a week to use to force feed the tarantula for over a month. 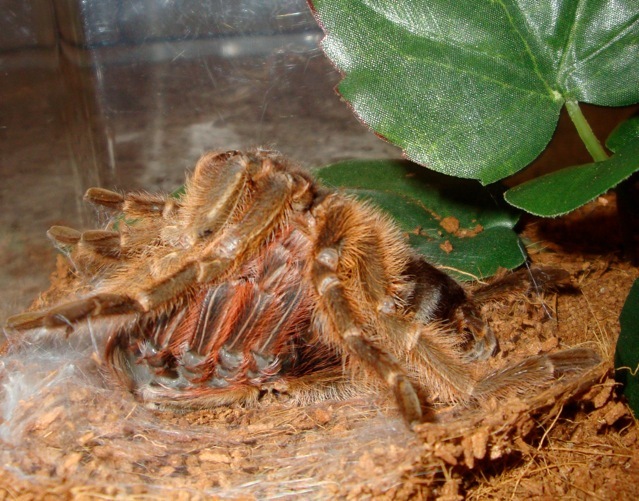 If the tarantula had molted again, she probably would have been able to eat without assistance. 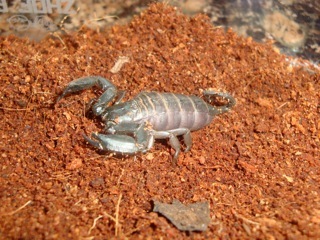 Sadly, however, she died 7 weeks after her bad molt. This is a tarantula's molt. The white spots on the abdomen are the booklungs. All spiders have booklungs, but tarantula's booklungs aren't as developed as the booklungs in true spiders. Tarantulas cannot move and breathe at the same time, while true spiders can. Breeding tarantulas is tricky. Male tarantulas can be in grave danger during mating, because the female may attempt to eat him! It also takes a LONG time before you have slings. It can take as long as 2 YEARS! 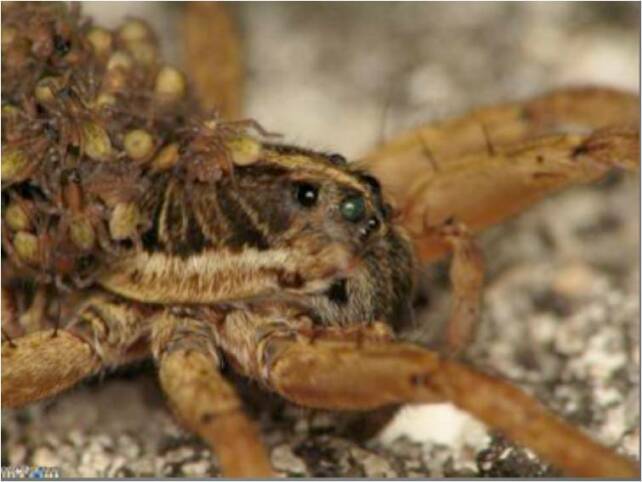 The female waits until conditions are just right for her before she has an egg sac. If you are lucky enough to have slings, you will be separating up to 2000 babies into deli containers! These slings are tiny. Slings are fed flightless fruit flies for up to two years. Tarantulas flip over on their backs and slowly push out of their old skin. This is called molting. Sometimes it takes a few hours. 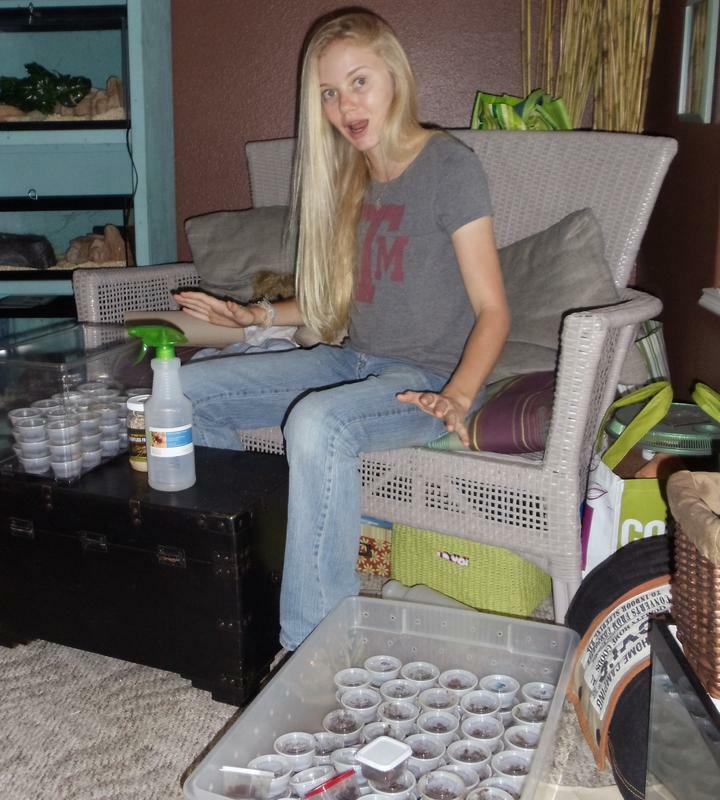 This is Courtney's Mexican Red Rump tarantula named Liberty. 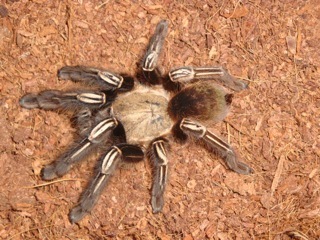 Many taratula keepers, including my mom at first, think their tarantula is dead when they find it on its back. My mom almost tossed out my first tarantula when she thought it had died! If a tarantula is on its back, it is molting. Get a camera ready! It's a great time to start taking pictures. There are many stages to molting and all are interesting. 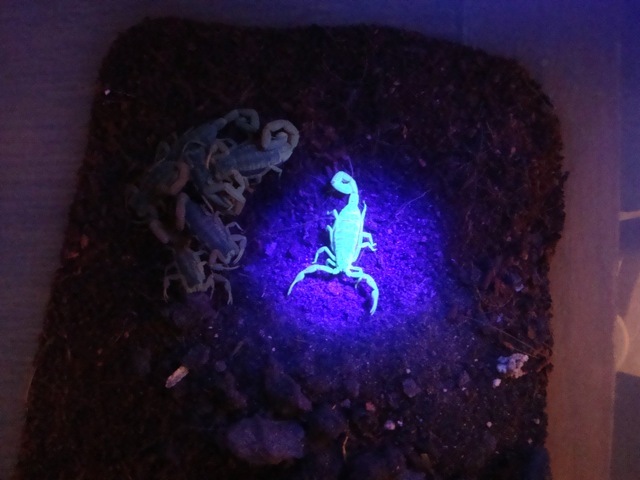 All scorpions glow (fluoresce) when under a blacklight. They have an enzyme on their exoskelton that continues to glow after the scorpion is dead. 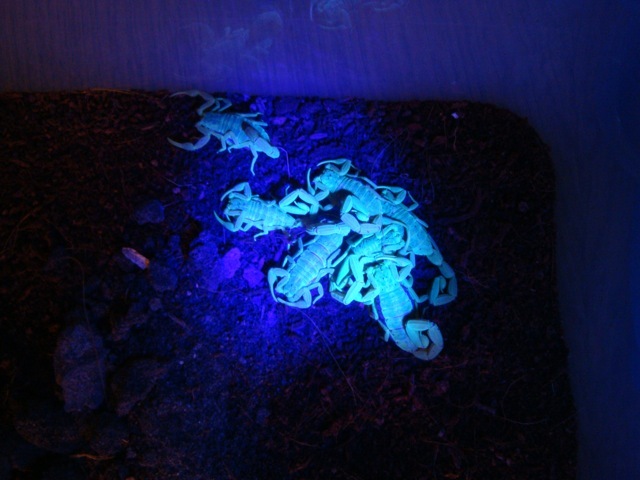 Scorpion fossils even glow! 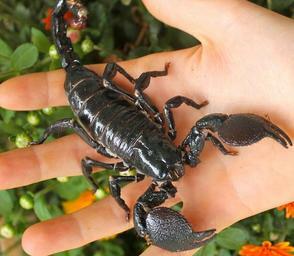 You can buy a scorpion hunting flashlight and go on a scorpion hunt. 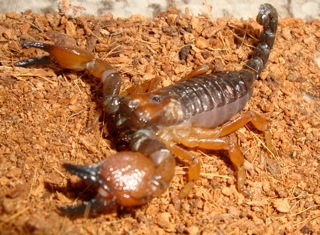 Scorpions, like other arachnids, eat many harmful insects. Spiders use their fangs to catch and kill their prey. Because spiders inject toxins with their fangs, they are venomous. 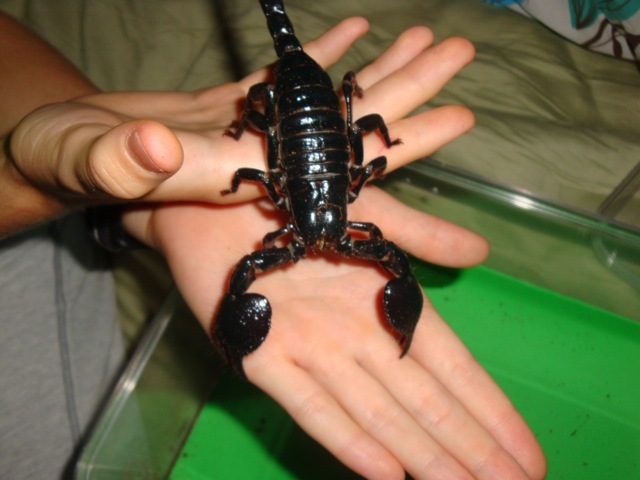 Poisonous animals have to be touched or eaten for toxins to be delivered. Arachnids are spiders, scorpions, mites (including chiggers), ticks, and harvestmen. Harvestmen are commonly known as "Daddy Long Legs." shed its skin and will darken as its exoskeleton hardens. Arachnids, like scorpions and spiders, don't fossilize well. Because of this, scientists disagree on the evolution of these critters. All spiders that are not tarantulas are called "true spiders." Many scientists believe tarantulas are ancestors to true spiders, since true spiders are more advanced in many ways. Some true spiders are: Black Widows, Wolf Spiders, and Jumping Spiders. The most obvious difference between tarantulas and true spiders can be seen in the fangs. Tarantulas have fangs that point downward, while true spiders have fangs that oppose each other. All of the systems in true spiders are more developed than those in tarantulas. For example, because of a more advanced respiratory system, true spiders can move and breathe at the same time. This helps true spiders move faster and cover more distance without stopping. Tarantulas cannot breathe while they are moving. They have to stop for short periods to catch their breath. Tarantulas and true spiders all have booklungs to help them breathe, but the tarantulas' booklungs are far less advanced. The brains of true spiders are also more developed than those in tarantulas. Portia Jumping Spiders are true spiders and are very intelligent. Through many tests, scientists have discovered that these interesting critters can actually think and solve problems. 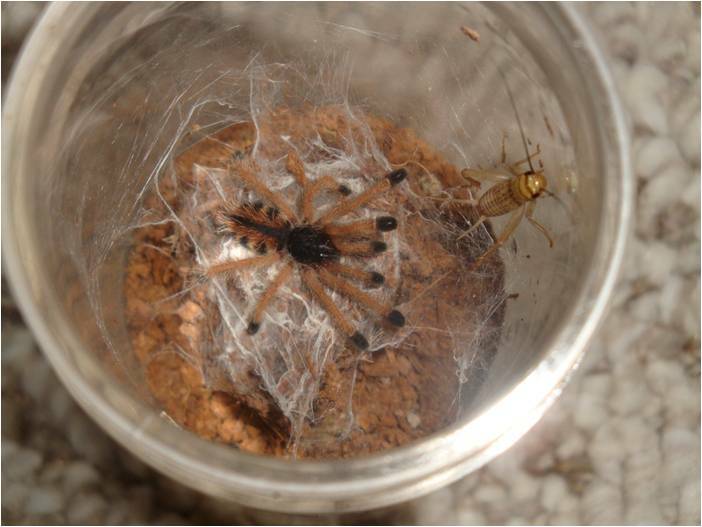 During one of the tests, researchers put a Portia Jumping Spider in a room with another true spider, an Orb Weaver. Portia Jumping Spiders only eat other spiders. The reaserchers created a problem. They set up a barricade so the Portia Jumping Spider could not reach the Orb Weaver. The Portia Jumping Spider would have to problem solve in order to reach the other spider. The reaserchers created a solution, a dog with a mechanical walker. The dog walked laps around the room twice passing the Portia Jumping Spider and the Orb Weaver. On the third lap, the Portia Jumping Spider jumped on the dog and rode around the room. When the dog reached the Orb Weaver, the Portia Jumping Spider jumped off and ate the Orb Weaver! Scientists continue to study the similarities and differences between tarantulas and true spiders. The more we understand about these critters, the more we can appreciate them! Special tongs are used to hold the female back so the male can escape. 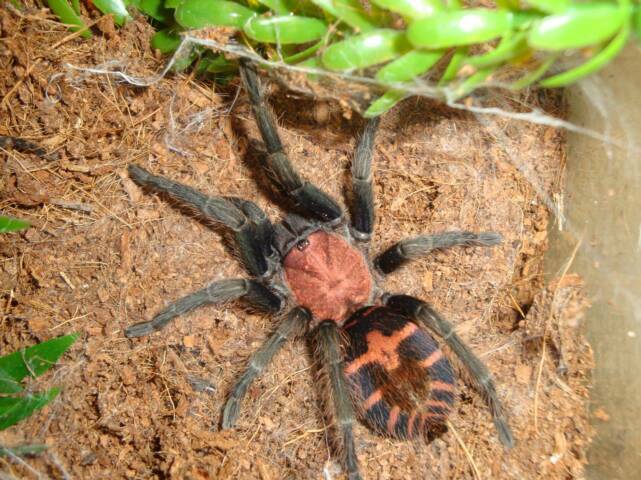 These Mexican Red Rump tarantulas were bred in Dec. 2010. *See our Video Blog page on this website! Tarantulas make such easy pets that we have over 40 of these graceful critters. It's inexpensive to house and feed them, and they can be left alone for weeks. 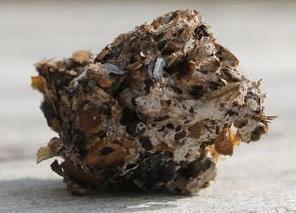 We use a mix of 3 parts peat moss to 1 part vermiculite. It's inexpensive and tarantulas are more comfortable on it than coconut fiber. Vermiculite helps keeps your substrate mold free. 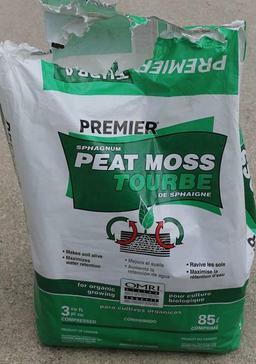 Store left over peat moss or use it in flower beds and pots! 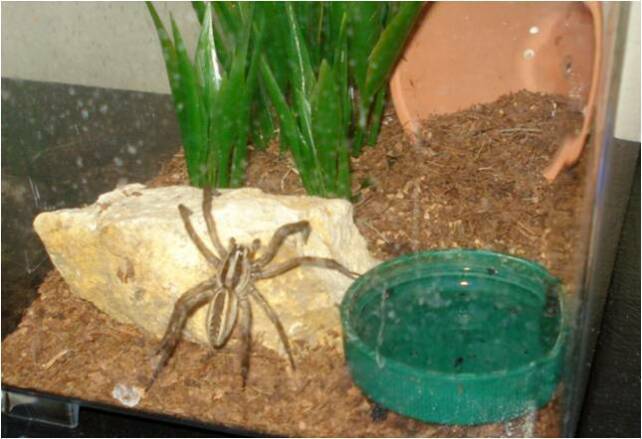 Most tarantulas get enough moisture from a simple water dish in their enclosure. Don't worry about keeping the humidity at a certain level. 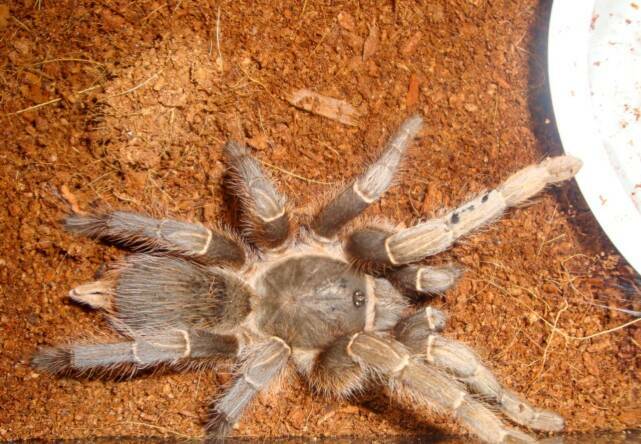 T. Blondi tarantulas are from the rainforests in Venezuela and need more humidity. We simply over fill our T. Blondi's water dish and let it soak into the substrate. Cobalt Blue and Pink Toe tarantulas also need more humidity. 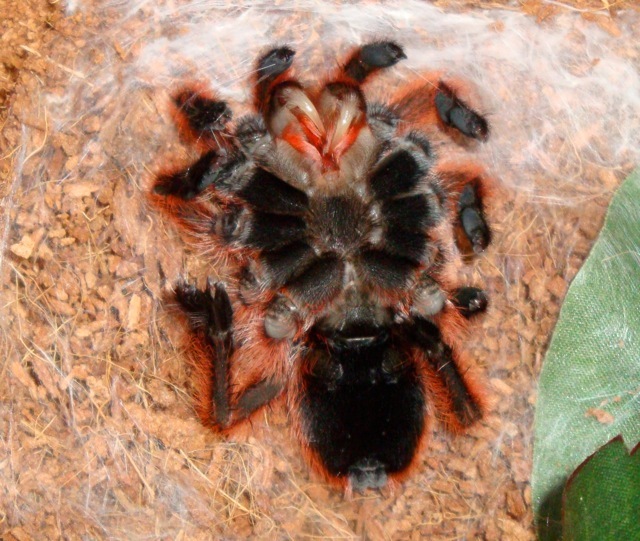 Red Concepcion, Green Bottle Blues, and Rose Hair tarantulas all like a drier habitat. A small water dish provides plenty of humidity for these tarantulas. Tarantulas don't need a large enclosure. In the wild, tarantulas hang out in small spaces and come out to eat or to find a mate. Many of our tarantulas are kept in shoe boxes from the Container Store. There are holes already in these enclosures and are perfect for your pet. Critter Keepers from pet stores can also be used. 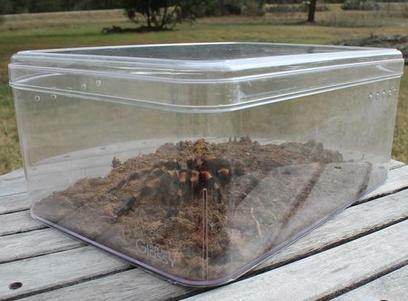 If you choose a terrestrial tarantula (one that lives on the ground in the wild) you can use a short enclosure like the one pictured on the left. 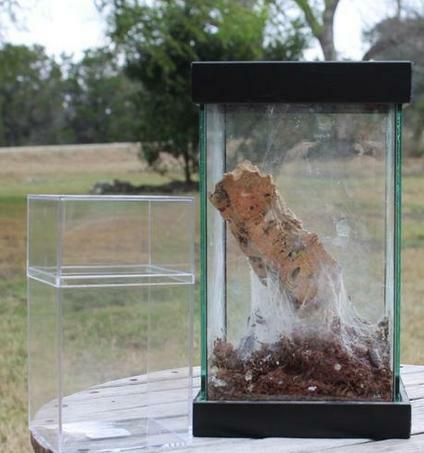 If you choose an arboreal tarantula (one that lives in trees in the wild) you'll want to choose a taller enclosure like the one pictured on the right. 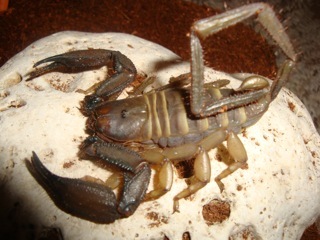 We use cork bark or terra cotta pots as 'hides' for our tarantulas. Heaters are not necessary for your tarantula, and they can be dangerous when placed on the bottom of your enclosure. When tarantulas get hot, they burrow. They can easily get overheated if a heater is used. Tarantulas are most comfortable between 50 and 80 degrees, but can survive temperatures between 40 and 90 degrees. Sponges are not necessary in your tarantula's water dish. Many pet stores and books will suggest using the sponges that are used with hermit crabs. These sponges harbor bacteria that can make your tarantula sick. A simple water dish is perfect for your tarantula. We use plastic lids from jars and bottles, because they're free and easy to replace. 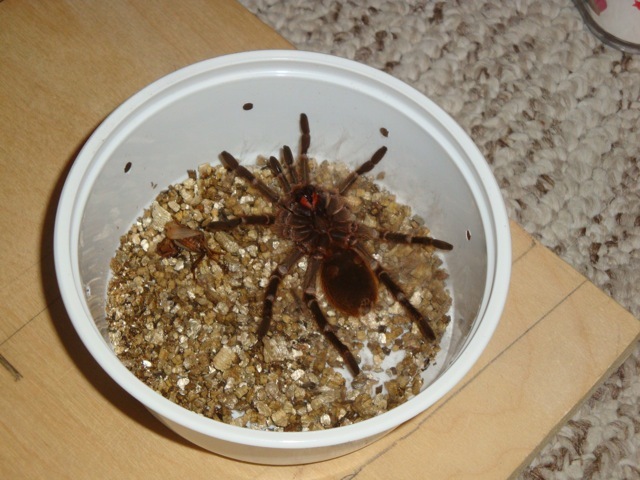 We feed our tarantulas about once a week, but they can go without food for a few weeks. We know tarantula breeders that only feed once a month. 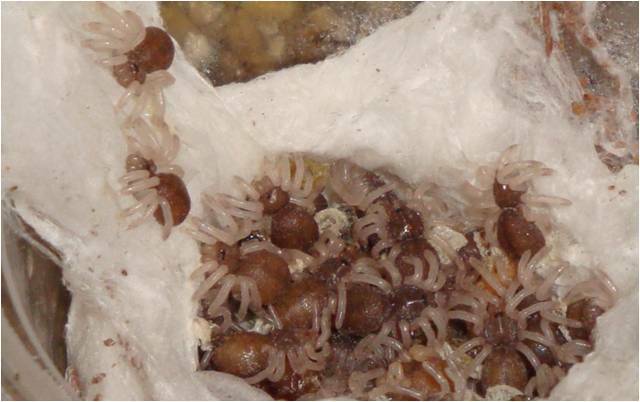 It's important to feed captive bred insects, since wild caught insects can carry parasites and/or insecticides. I lost my first tarantula due to nematodes. Nematodes are a parasite and are deadly to tarantulas. Our tarantulas eat crickets and b.dubia roaches. 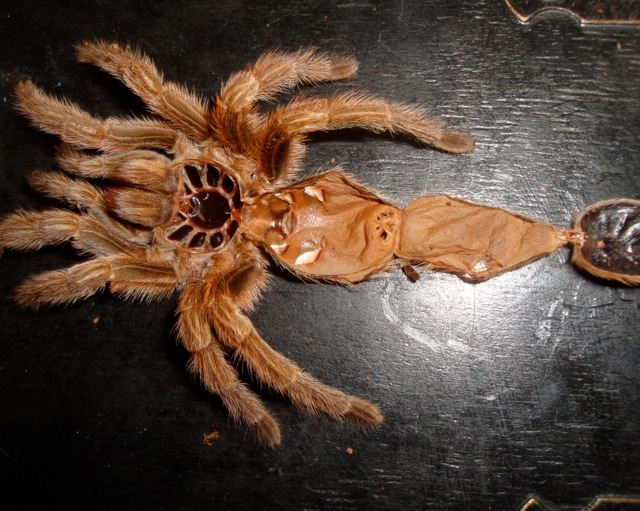 We toss 5 - 10 crickets in with our tarantulas depending on the tarantula's size. Our larger tarantulas eat about 4 large roaches each week. 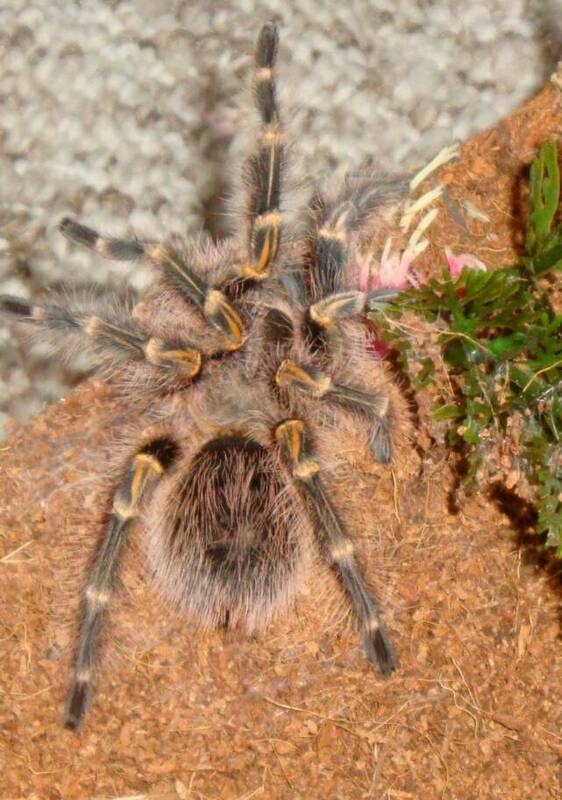 ​Erik and I have over 40 pet tarantulas. Some species we handle on a regular basis, while others we keep because they're beautiful! 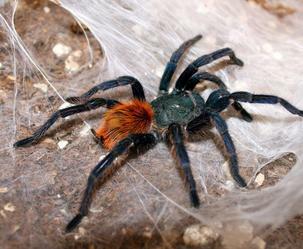 Tarantulas from the eastern hemisphere are more likely to bite as their first defense, so we don't handle them. Tarantulas from the western hemisphere of the world have urticating hairs that can make you itch. Tarantulas don't need affection, so you're not hurting them by leaving them alone. In fact, many tarantula keepers think leaving them alone is best. 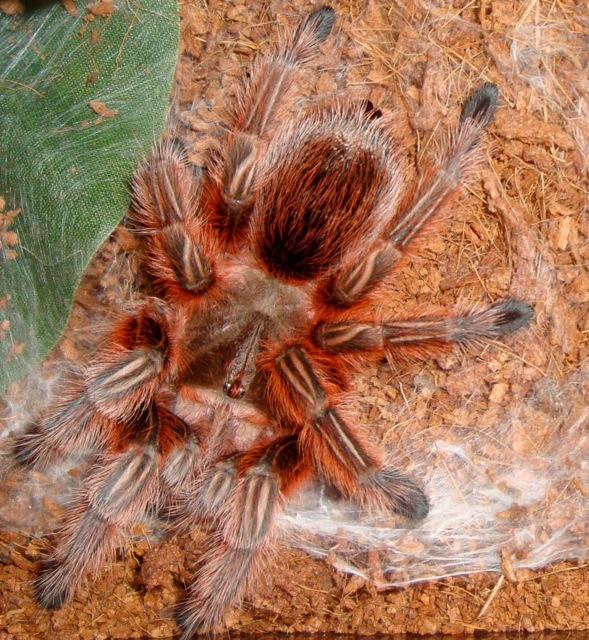 If you drop your pet tarantula, it could die. 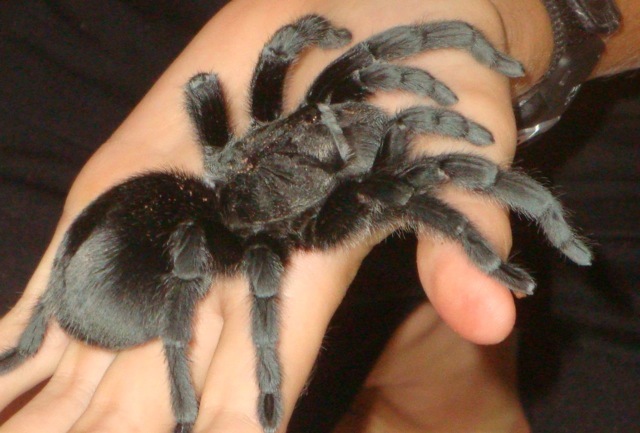 If you choose to handle your tarantula, wash your hands before and after. 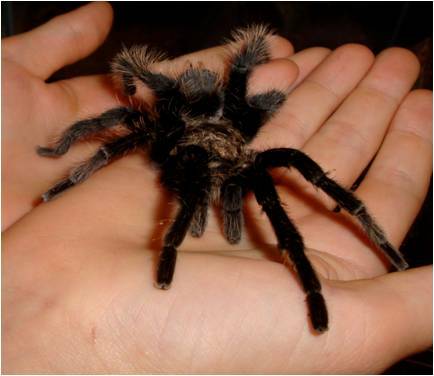 You want to handle your pet with clean hands to prevent spreading parasites that can make your tarantula sick. 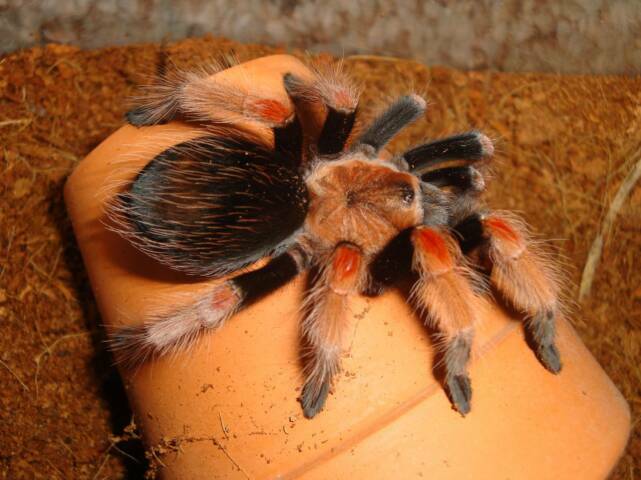 Washing your hands in hot, soapy water after handling your tarantula will help get rid of urticating hairs. Candles, scented sprays, and cleaners can be deadly for tarantulas and other critters. We never burn candles in rooms where our tarantulas live. We keep most of our tarantulas on shelves in our laundry room, and we use unscented detergent to help keep our tarantulas safe. There are over 900 different species of tarantulas in many colors and sizes. It's hard to pick just one! 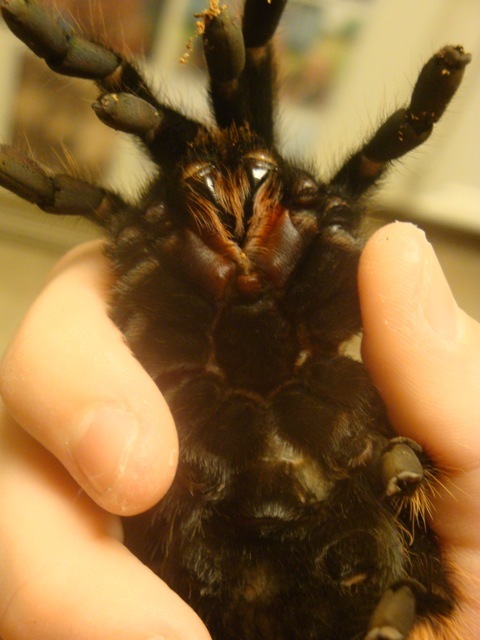 Most tarantulas are hardy and make great pets. 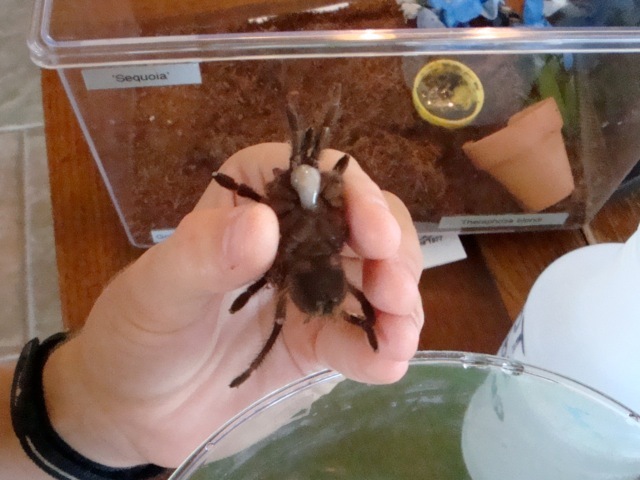 Enjoy some photos of our tarantulas and other arachnids! We rarely clean out our tarantulas' enclosures. We spot clean if we see mold or dead crickets. 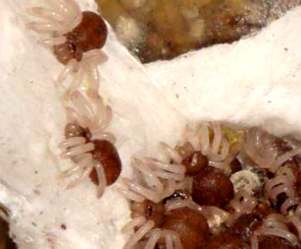 Some tarantulas 'clean up' by rolling cricket parts into a ball after they eat. These cricket balls (pictured below) can also get moldy, so those are removed. If you see white on the side of your enclosure (usually with Pink Toes) it's poop. Simply wipe it off with a wet paper towel. Tarantulas don't have an odor, so unless you have a mold problem or want to move your tarantula to a new enclosure, you won't have to change their substrate.